How can Pillar help me envision and achieve a financially secure lifestyle? The “What’s Important To You” consultation in our case precedes any other, this helps us optimize your estate for the benefit of your loved ones and the causes that are nearest and dearest to your heart (family vision). You will experience a culture of straight talk, trust and honesty where we simplify your life by taking the financial pressure off of you. You become the CEO of your family vision and Pillar, as your private wealth manager, will help you overcome the challenges you face in reaching your vision by utilizing our innovative private wealth management planning process. Pillar will also coordinate investment, tax, legal, M&A, insurance/risk, and non-financial solutions on your behalf. We deliver to you an easy to understand quarterly wealth management plan to track your progress. Since we are a fee based independent firm with no proprietary products you can expect objectivity and sound advice from us. How does Pillar’s innovative private wealth management planning process provide me with results-oriented advice? Our five-step new-client process is a series of consultations that take place between you and us. It is unique to each family and delves deep into your retirement and family financial vision. Our process is designed to help you find The Balance Between Wealth and Happiness. As your primary source for private wealth management, we provide you goals-driven, not market-driven planning. This innovative client-centered planning process is how planning should work. Your plan will account for inflationary periods such as the late 1980s, recessions, depressions such as 1929, market booms, market collapses such as 1974-1975 and 2000-2002, terrorist events such as 9/11, wars and other world conflicts. The result is an easy-to-understand plan that accounts for real-life events and helps you track progress towards your goals. You will receive quarterly plans illustrating your progress towards your goals. We can also run “what if” scenarios at key decision points in your life at any time. What allows Pillar to provide me private wealth management services that is in a class of its own? We are proud of the fee-based services we deliver to our clients due to our exclusivity. We work with a limited number of clients that we trust, respect and who share our business and family values; we are not all things to all people. Pillar’s private wealth management services cater to sophisticated and affluent families with $1 million investment account minimums and a $12,000 annual fee minimum. How does Pillar’s investment management process provide me peace of mind? We view your wealth/investments as a means rather than an end. We strive to assist you in achieving your life-goals…whether you dream of a comfortable and dignified retirement, worldwide travel or philanthropy. Pillar’s investment philosophy is based on providing you low turnover, tax efficient, liquid and diversified institutional-style mutual funds or electronically traded funds. Your portfolio will be allocated and rebalanced by Pillar with an eye on costs and tax ramifications. Our portfolio strategies and planning process have been tested against historical economic and world events. We’d like to share two quotes, representative of our beliefs, from the Yale Endowment Annual Report 2005. “But how, you might ask, can defense be so important to Yale’s remarkably positive results? 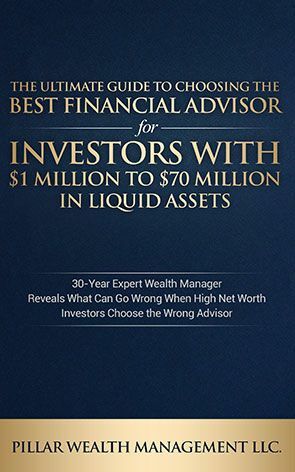 Starting with that great truism of long-term success in investing – if investors could just eliminate their larger losses, the good results would take care of themselves – we remind ourselves of the great advantages of staying out of trouble”. “The obvious risks in manager selection are two: hiring managers after their best results and terminating managers after their worst”. What client-centered services will Pillar provide me to help me achieve financial security? Our client-centered services revolve around solving your financial challenges. Please click here to view a detailed list. How does Pillar’s independence and fee-based approach create a culture of straight talk and honesty? Pillar is a fee-based independent firm with no proprietary products. You can expect a culture of straight talk, honesty and sound advice from us. Our product is The Best Advice We Can Give You. How is Pillar accountable to me as a client? We return your calls and emails promptly, track and monitor your rates of return, provide you a go-to person when your main contact is not available and work to keep your fees and expenses low. You can expect us to understand your financial goals and to provide you workable solutions to ensure your financial security. We bring to the table real life experiences of helping people just like you. When you come in for your first consultation with us, the “What’s Important To You” meeting, you should look to tell us about yourself, your family and what is near and dear to your heart. This is an opportunity for us to evaluate each other and to build trust and confidence in each other. While the bulk of the meeting will cover these types of details, you will need to bring the following with you. Current life insurance, long-term care, homeowners, automobile, umbrella policies, etc. Without all these documents we will not be able to understand your full financial situation and we will therefore reschedule your meeting.